Amp was originally an energy drink version of Mountain Dew, made by PepsiCo, and released in 2001. There have been many versions of Amp Energy since it's introduction in Pepsi's hopes of competing with Red Bull and Monster. At one time there was around 15 products in the Amp Energy Drink line. Pepsi revamped their entire line eliminating all of the products and developing just 3 new "functional" type drinks. However, Pepsi scrapped this concept and recently released a brand new Amp Energy Drink line up. Amp is currently the 5th most popular energy drink brand in the USA. Amp Energy Drink isn't recommended for children or for those sensitive to caffeine. 16 Pack - Amp Energy Boost Original - 16oz. 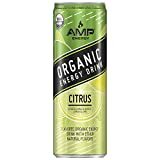 8 Pack - Amp Energy - 16oz. How Does Amp Energy Drink Compare? Amp Energy Drink contains 8.88 mgs of caffeine per fluid ounce (30.01mg/100 ml).